기술은 끝없는 가능성으로 21 세기를 촉발시킵니다. TimeTec에서 우리는 탁월한 클라우드 노동력 관리 응용 프로그램, 액세스 제어 및 보안 시스템, 스마트 장치 및 작업을 원활하게하는 AI 로봇과 함께 비즈니스를위한 새로운 장을 열었습니다. 각 아이콘을 클릭하여 클라우드 솔루션을 탐색하십시오. * 모든 TimeTec 클라우드 시스템, 하위 시스템 및 스마트 장치는 독립 실행 형 또는 통합 된 형태로 설치되어 조직의 최상의 역할에 맞게 조정하고 외부 세계와 공동 작업을 수행 할 수 있습니다. Company A is using TimeTec TA and TimeTec Leave to manage its staff force of around 2000 people. 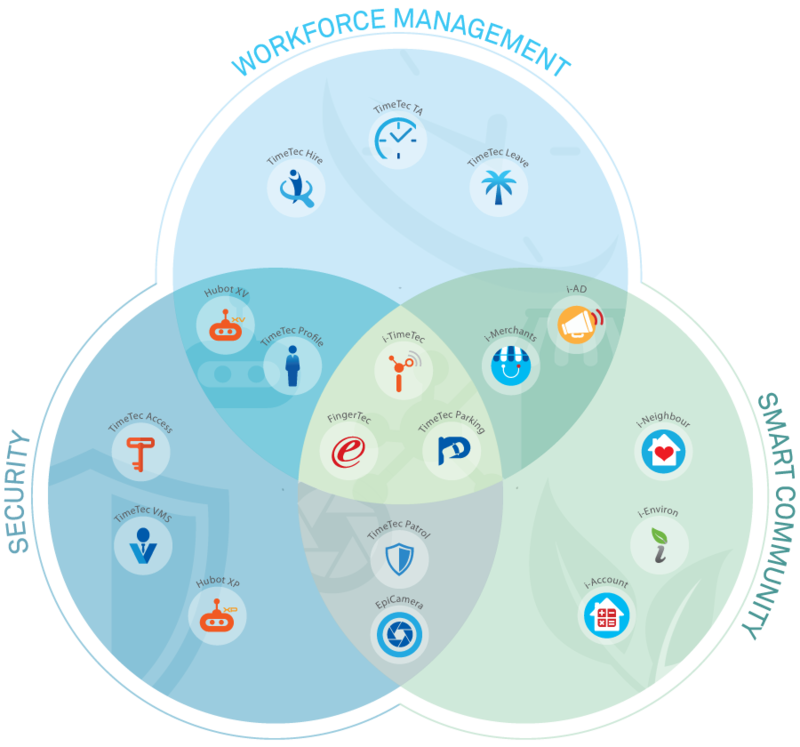 At the same time, the company expects TimeTec to offer a recruitment system complete with an onboarding feature (TimeTec Hire) to ease these crucial hiring processes with all the applications sharing only one centralized database at TimeTec Profile. On the hardware side, biometric terminals (FingerTec) are installed at entrances of every outlet for door access and time attendance data collection tool and TimeTec Access is installed as an additional access control system. While the door access data is managed by TimeTec Access, the attendance data from the biometrics terminal will be processed by TimeTec TA concurrently. At the Company A HQ lobby, the guards on duty are using TimeTec VMS to manage visitors comings and goings using QR codes to be scan TimeTec QR master reader integrated with TimeTec IoT devices BLE-2, BLE-5 and BLE-16, that are connected to TimeTec Access for employees' access control purposes. With the QR codes generated by the TimeTec VMS, visitors can access the authorised doors, flap barriers and elevators. Additionally, the guards at HQ are also using TimeTec Patrol as a tool to perform daily round-the-clock guard tour based on their patrol schedules and NFC checkpoints to heighten security. When pre-registered visitors enter a parking area, the barrier gate installed with TimeTec BLE-2 and License Plate Recognition (LPR) will open to prompt TimeTec, i-Ad and i-Merchants promotions on the guest's smartphone that highlight the nearby shopping mall's latest deals. The guest can pay for his parking fee and generate an e-receipt via the same App because the Company A is using TimeTec Parking as its parking system. The management has a plan to reduce security guards count by deploying TimeTec Hubot for Visitor Management System and Patrol purposes. And, if the same guest decided to visit his relative that is staying in a neighbourhood that is using i-Neighbour (integrated with i-Account for Smart Community Accounting System), he can use the same App to pre-register for himself. 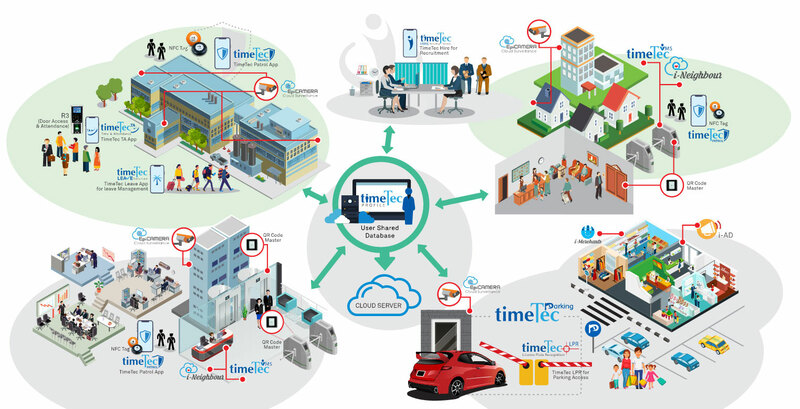 EpiCamera as a cloud surveillance system can be integrated with TimeTec Patrol, TimeTec Access, and i-Neighbour to improve the overall security of the area and i-Environ can be added as an extra environmental module to bring about greater benefits to the communities. © 2019 TimeTec 컴퓨팅의 수단. Bhd가. 모든 권리 보유.